The Greens at Santa Rita Springs is a gated active adult community in Green Valley, Arizona. This 55+ community in Pima County enjoys scenic views of the Santa Rita Mountains as well as the Torres Blancas Golf Course. Active adult homebuyers can select a resale attached or detached home that meets their needs. Not only do residents have access to their own community pool, they also enjoy all of the great recreation centers offered by Green Valley Recreation (GVR). GVR fosters an environment where both working adults and retirees live fulfilling lifestyles. Residents of The Greens at Santa Rita Springs have their very own outdoor pool and spa within the community gates. Fees paid to Green Valley Recreation (GVR) give membership access to 13 recreation centers in the Green Valley area. These recreation centers contain numerous hobby rooms, meeting rooms, fitness centers, restaurants, and more. GVR's outdoor amenities include 13 swimming pools, miles of walking and biking trails, sports courts, fishing lakes, parks, and so much more. Whether it s fitness, sports, or social activities, GVR delivers everything you ll need to stay active. The Greens at Santa Rita Springs is an all resale community with 224 homes built between 1997 and 2000. Homebuyers can select an attached or single-family home that offers around 1,300 to 2,200 square feet of living space. Residences in the community typically have two to three bedrooms, two to three bathrooms, and an attached garage. All homes offer main-level living with low-maintenance exteriors and private outdoor entertaining areas. Residents of The Greens at Santa Rita Springs live a carefree lifestyle in a private setting. With less than 250 homes in a gated community, it's easy to get to know your neighbors and make lifelong friendships. GVR offers an extensive list of clubs, events, and classes throughout the year. Whether you want to continue your education, learn a new hobby, or embrace your competitive side, you'll be sure to find an activity that suites your unique taste. GVR offers everything from card and craft clubs to trips and performances. The Greens at Santa Rita Springs is located in Green Valley, Arizona. Green Valley is a conglomerate of several dozen active adult neighborhoods. With many retail opportunities and public golf courses, Green Valley is a great location for today's active adult. 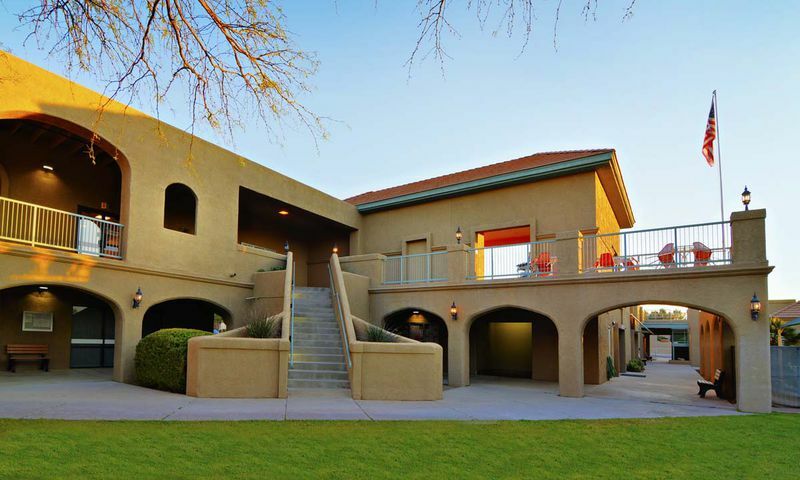 This Southern Arizona 55+ community is located just off Interstate 19, making it easy to reach Tucson s attractions. Whether you're an outdoorsman, social butterfly, or simply prefer to relax, The Greens at Santa Rita Springs enjoys a great location with many things to see and do throughout the year. With so much to do both in and round this active adult community, The Greens at Santa Rita Springs is a 55+ oasis in Southern Arizona. Within the gates of The Greens at Santa Rita Springs, residents enjoy their own private outdoor amenities. There are plenty of activities available in The Greens at Santa Rita Springs. Here is a sample of some of the clubs, activities and classes offered here. The attached homes can be found on Waterview Drive and Crenshaw Lane. These are great maintenance-free options for active adults on the go. Attached homes typically have two bedrooms, two bathrooms, and an attached garage. Low-maintenance exteriors and ranch-style homes make these ideal for 55+ homebuyers. Please Note: Floor plans are not available at this time. The community's single-family homes offer low-maintenance ranch-style homes with a bit more privacy. Most single-family residences have two to three bedrooms, two to three bathrooms, and an attached two-car garage. Please Note: Floor plans are not available at this time. I've lived here for 5 years now and really love it. The neighborhood is very quiet and the people are friendly. My favorite parts about living here are the views, the amenities so close by and the endless options of things to do. I stay very active and have tried lots of things I always wished I had time to do! 55places.com is not affiliated with the developer(s) or homeowners association of The Greens at Santa Rita Springs. The information you submit is distributed to a 55places.com Partner Agent, who is a licensed real estate agent. The information regarding The Greens at Santa Rita Springs has not been verified or approved by the developer or homeowners association. Please verify all information prior to purchasing. 55places.com is not responsible for any errors regarding the information displayed on this website.